The Silver Ravens have defeated Paracount Barzillai Thrune and liberated Kintargo, but unless steps are taken to protect what they've won, it's only a matter of time before Cheliax's rulers respond with open war - one that could likely destroy the Silver City. The key to the city's last defence may lie hidden in a sprawling scroll recovered from the wicked inquisitor: the Kintargo Contract. Within this contract's clauses and stipulations lurks a cunning loophole that gives the heroes an opportunity to use Cheliax's own love of law against it, not only securing the city, but also freeing the surrounding region from the infernal machinations of House Thrune and the Church of Asmodeus. Yet as the heroes scramble to parse the contract and Kintargo reels from its recent upheavals, an old menace from the city's past strikes. Before Kintargo can be truly safe, the Silver Ravens must save the city from a monster of its own making! 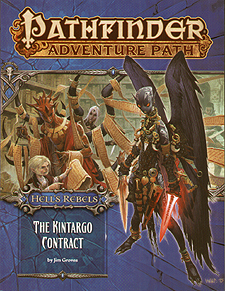 "The Kintargo Contract," a Pathfinder adventure for 13th-level characters, by Jim Groves. A look into the secretive and enigmatic strix, by Robert Brookes. Fiend hounds and infernal trickery in the Pathfinder's Journal, by Stephanie Loree. Five monstrous threats, by Kalervo Oikarinen, David N. Ross, and Todd Stewart.